Notes: Let me start by saying how much I love this notebook…a lot. Rhodia is without a doubt my favorite paper for fountain pen use, and the way this notebook looks is just icing on the cake. The combination of the great looks, convenient size, durability and great paper make this notebook a no brainer. Between writing the review and formatting it here, I’ve acquired another Rhodia Large Webbie (orange cover, dotPad ruling). This has the same paper as the R by Rhodia pad I previously reviewed, which is really good stuff. Check out that review HERE to compare/contrast/read! Thanks and enjoy the review! I opted for the large Webbie in black. It’s available in orange as well, but if you haven’t noticed my preference for all-black everything, just check out a few other posts and it will become evident. 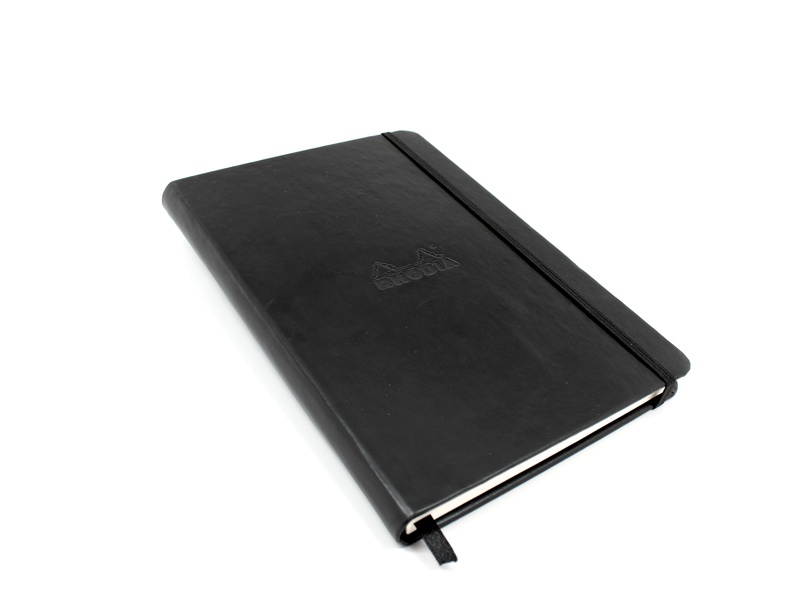 The cover of the Rhodia Webnotebook is a soft-touch leatherette that feels great. The notebook has some weatherproof qualities, which is nice. This notebook will definitely survive a trip through the rain outside of a bag without getting all wavy and warped like cardboard/cardstock tends to get. 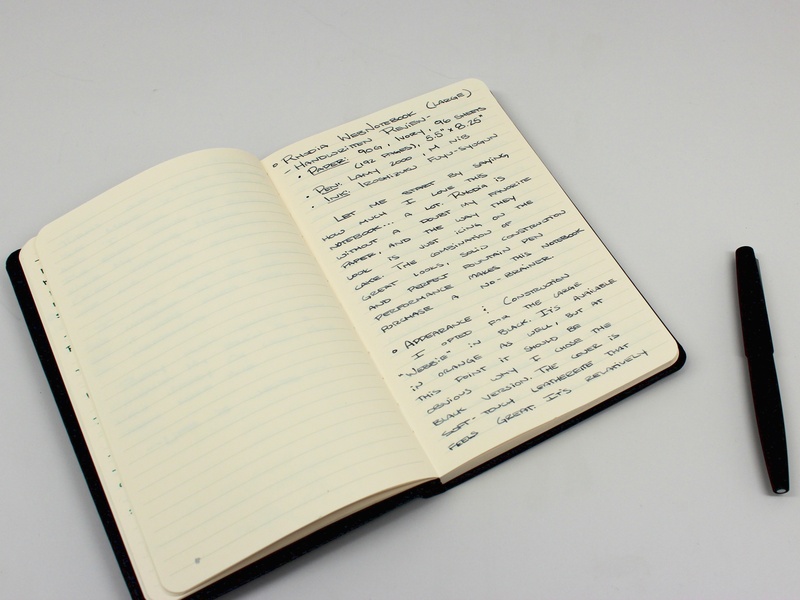 An important part of the construction of the notebook is how it lays flat. 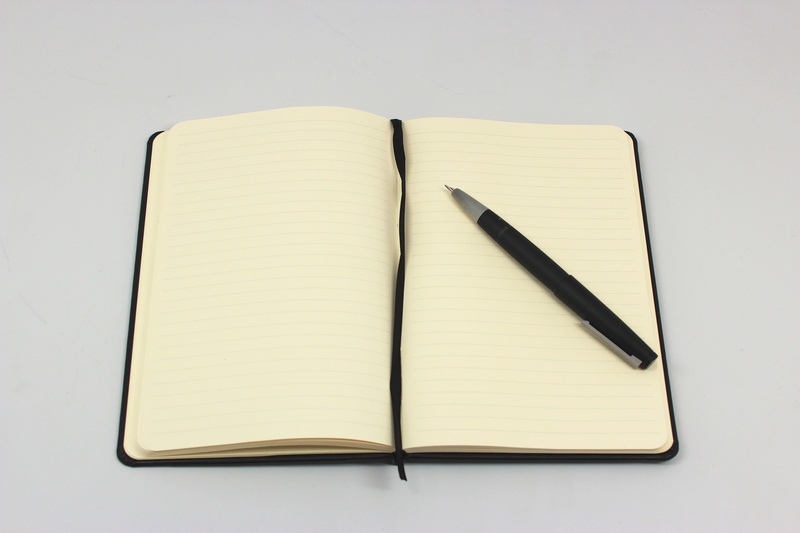 Many bound notebooks have problems laying flat on a writing surface, making it hard to write in. There is no such problem with the Webbie. Another nice touch is the ribbon in the binding that’s used to keep your place in the notebook. The placeholder makes the notebook open up nice and easy to the intended page without being so long that it hangs out of the notebook. The size of the notebook makes it great for throwing in a bag, but not taking up the entire thing. There’s a small enough footprint to where it doesn’t take up too much valuable bag space and it’s constructed well enough to last a long while. Across it’s entire line, Rhodia is probably the most fountain-pen friendly paper out there. I’ve tried countless Rhodia products and all of them perform great. Most Rhodia products have their 80g bright white paper with violet ruling, however, the Webnotebooks have 90g ivory paper with grey ruling. It’s hard to judge the performance difference between 80g and 90g paper, but both perform well with no bleeding or showthrough with most inks. The lack of bleed/show makes every page of this notebook usable, which is great if you want to get the most out of your notebooks. The paper is very smooth, especially with the gold-nibbed Lamy 2000. Dry time on Rhodia is a bit longer than standard copy paper, but the end result is definitely worth the wait. From the R by Rhodia review:Another characteristic that sets the R line apart from the standard line of products is the use of ivory colored paper. It’s a nice shade of ivory that is easy on the eyes, and doesn’t appear to be too yellow. It compliments most inks very well, but I still wouldn’t use it for ink reviews, as the ivory does change the appearance of ink a little bit. It’s miles above a yellow legal pad, and looks much nicer too. The color of the ruling is also different from the rest of the Rhodia line. The light violet lines are replaced with a subtle grey, which compliments the ivory paper better than a violet one would. The Rhodia Large Webnotebook is a great notebook. It’s solid construction and durable cover combined with the great paper make it a great addition to my collection of paper and notebooks. The 90g paper is a nice departure from Rhodia’s standard bright white. The light grey ruling is easy on the eyes too. It’s really hard to find something about this notebook that I don’t like. I haven’t had any complaints, and I’m about a quarter of the way through the notebook. 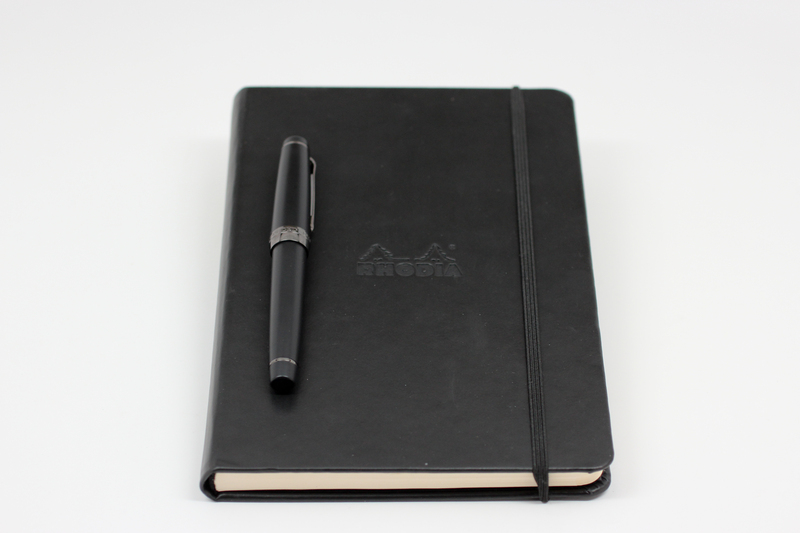 The Rhodia Webnotebook is available in three different rulings (lined, dot, and blank) in either black or orange, in either large or small sizes. The wide array of configurations are sure to appeal to everyone. I’m really enjoying my Webbie, and I couldn’t recommend it more, especially if you’re a fan of Moleskine notebooks, but want to actually be able to write in them with a fountain pen without making a feathery mess. Disclaimer: This pad was given to me free of charge by the fine people over at Rhodia. Huge thanks to Karen at Exaclair (the US distributor of Rhodia) for the paper goods! Even though the pad was provided for this review, I still stand by everything I have said in my review 100%. I have been, and will continue to be a Rhodia user, it’s some of the best stuff out there. It’s Here! The June 2013 Blog Carnival of Pen, Pencil and Paper! I bought a Webnotebook and just wasn’t crazy about the ivory/yellowish paper. Do you know if it is available with a white paper? Plus, although I loved the soft leatherette feeling of the cover, I found it damaged pretty and I am rough on my notebooks! Still, you can’t beat that paper. It is pretty amazing. no its not… 😦 I recommend getting a Clairfontain clothbound notebook. Significantly less cost, more paper with the same if not better quality then the Rhodia. This is a premium notebook though and the cloth notebook is more of a school notebook. I’m not aware of anything else that has the same cover quality as the Rhodia but you can just add a cover too like mine has a Saddleback leather cover. I’ve heard good things about everything Saddleback, I have yet to try anything from them though. If you really want to get crazy, there are leather covers for the Webnotebook out there too. Unfortunately no white in the Webbie. Rhodia/Clairefontaine/Exaclair are pretty open to consumer suggestions though. I would recommend writing them and pleading your case for a white-filled Webbie, you never know, they may consider it. The paper in these notebooks really is amazing! I agree about the light grey ruling being just subtle enough. Great review. The grey is definitely a nice departure from the violet. Something about violet ruling on ivory paper just wouldn’t work! Great review… I love mine too. I’ve been waiting to get my hand on this one too for a long time. I was going to get the dot pad but they were sold out so a lined one is what I got. Next time its going to be orange with dot pad and after that I’ll get a blank one. Thank you! I have both the lined and the orange dotPad, both serve their different purposes, and I enjoy them both equally. The dotPad paper is probably my favorite ruling out there. *Wipes drool* Great. I have the small one and my issue with it was that it was so small. Sometimes small is good, but in this case, I wanted a big one. … And now I’ve seen this. Great. Just great. Sorry Azizah 😦 – I feel like every time I influence a purchase decision I’m taking food out of your cats’ bowls. I had a pocket webbie and I actually ended up disappointed in it. I had to really hold it down to keep it open (didn’t lie flat) but my biggest disappointment was that I did have certain inks bleed through to the other side whereas on my Rhodia 80g paper it didn’t. Same with all other Clairefontaine paper and Quo Vadis Habana notebooks (they did not bleed). Not sure if I just had a fluke notebook or not. I would love for it to have been a fluke because I prefer the size of the large webbie over the Habana. Plus, you gotta love that dot grid…. Little late to this game Ed but the Rhodia has been my top choice as well after filling up 3 or 4 of the other major brands I went back to the Rhodia as my favorite. IMHO most of the major brands have figured out good behavior with fountain pens but the lay flat and ruling size keeps bringing me back to the Webbie. I haven’t really tried any other bound journal style notebooks, except for the Moleskine. That thing was pretty terrible for fountain pen writing, and didn’t feel nearly as sturdy. I wish the ruling on the Webbie was slightly narrower, but that’s all handwriting dependent.  Ed – I have a brief comparison on the 5 brands I have tried. It probably doesn’t fit here so if you’re interested drop me an email at bob@mypenneedsink.com. It’s nothing great just a small word doc I can pop into the text of a return email.